How to install the fan using the Vibration-Compensators? Some of my Noctua fans have slightly different colours, can you exchange them? Which is the best Noctua fan for 3D printing? Where can I find the production batch code? First, pull the Vibration-Compensators through the mounting holes of the case. Then put the fan onto the Vibration-Compensators and pull them through the mounting holes of the fan. Unfortunately, slight variations in colouring are impossible to avoid and can occur due to reasons such as tolerances in source materials, exposure to sunlight or other environmental conditions. 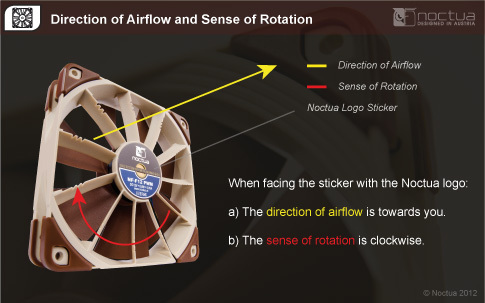 As a result, Noctua can not exchange fans due to colour differences. 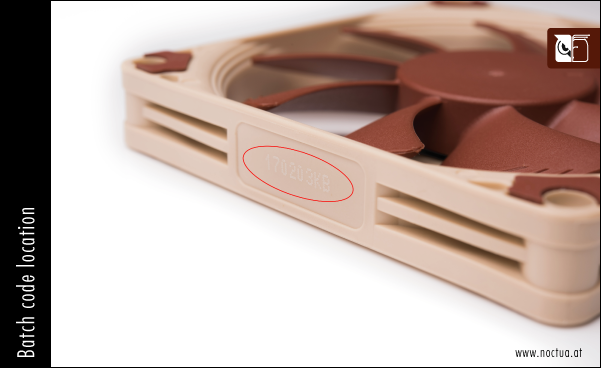 Noctua’s manufacturer’s warranty guarantees the proper operation of the product throughout the six year warranty period, but it does not cover slight visual variations. If you’re not satisfied with the colours of a Noctua fan, please return it to your dealer. Noctua’s premium quality quiet fans are widely popular in 3D printing. 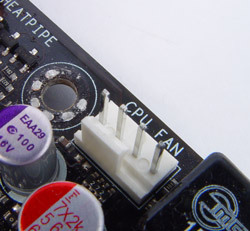 They are ideal both for providing extra cooling to the printed part and for replacing noisy or broken stock fans. Many Noctua fans are available in 5V and 5V PWM versions that are particularly easy to integrate into 5V based 3D printing environments. 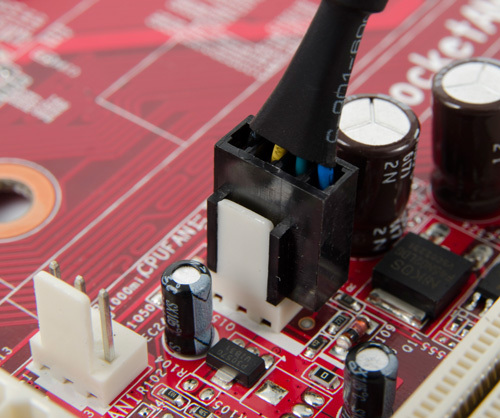 24V versions are available in 120 and 140mm size in the industrialPPC range. Fan replacements: Many 3D printers come with loud stock fans or suffer from fan failures after longer times of use. In these cases, Noctua fans such as the NF-A4x10 and NF-A4x20 have become popular replacements for stock 40mm fans due to their superior quietness of operation and long term stability. 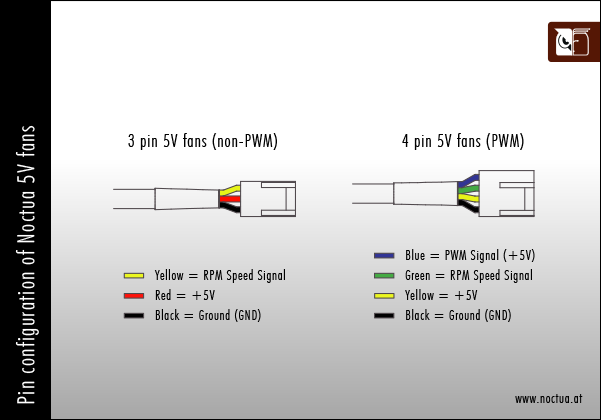 Both fans are available in 5V versions that can be powered directly from many printers’ native 5V circuits. There is a large number of tutorials on YouTube and other sources that explain how to replace the stock fans in 3D printers from popular brands such as Anet, Cetus, Creality, E3D, FlashForge, MakerGear, Prusa, Robo 3D or Wanhao. 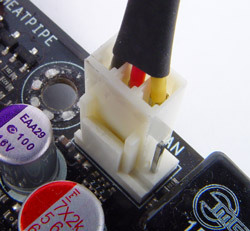 Since many of these printers come with proprietary fan headers, it is usually necessary to either cut the fan cable and solder the original fan’s connector to the new fan or to use the OmniJoin™ adaptor set supplied with the NF-A4x10 or NF-A4x20. 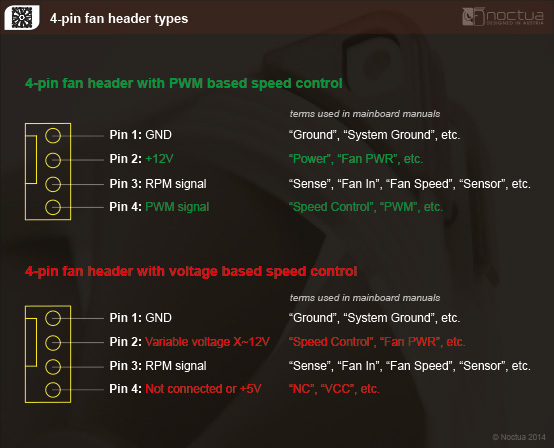 If your printer is not using a standard 3-pin or 4-pin Molex fan connector, please refer to our FAQs (5V, 12V, 24V) to check the standardised pin-alignment and pin-configuration used by all Noctua fans and make sure that you connect the fan correctly. 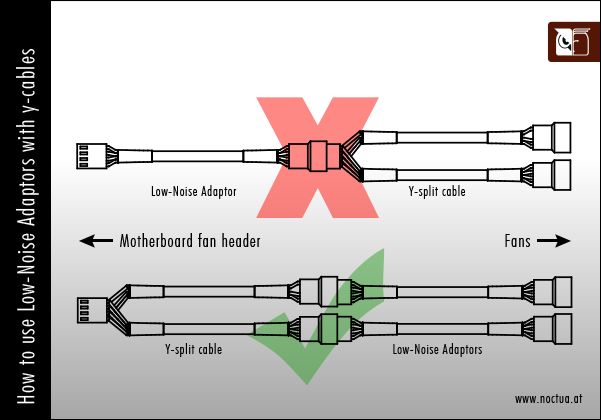 Noctua can not be held responsible for any damage caused to the fan, printer or other components due to misaligned connections. Extra part cooling: Adding extra fans to 3D printing setups is a highly effective method to improve print quality. This is especially true for small, thin objects with fine details as well as bridging and overhanging structures where the freshly printed layer often does not have enough time to cool down before the next layer is being added. In these cases, adding extra ventilation helps the printed parts to cool down more quickly and can thus lead to better print quality. The biggest improvements are usually seen with PLA materials, but careful extra ventilation can also help to improve the results with ABS and other materials. The most common way of adding extra fans is to use customised fan mounts or ducts that are installed to the extruder and funnel the fan’s airflow to go directly to the printed object. A wide range of duct designs is available on 3D printing databases such as Thingiverse. While some of them are tailored to particular 3D printer and fan models, others are multi-purpose designs that can be used with various configurations. 40, 60 and 80mm fans are most commonly used for this purpose, so the NF-A4x10, NF-A4x20, NF-A6x25 and NF-A8x25 fans are the most popular models when it comes to providing extra airflow over the printer’s hot end.